Today, an increasing number of GNSS receivers are capable of receiving signals on multiple different frequencies, such as L1, L2 and L5. Although this multi-frequency capability, as well as having to process signals from diverse navigation systems such as GPS, GLONASS, Galileo or BeiDou, make the receiver design more complex, they ensure a better quality of service for the end user. Multi-frequency and multi-constellation processing not only improves positioning accuracy, service availability and robustness, it also makes the positioning process less vulnerable to interference, jamming or spoofing attacks. The R&S SMW200A GNSS simulator is the ideal tool for efficient test and characterization of multi-constellation and multi-frequency GNSS receivers. 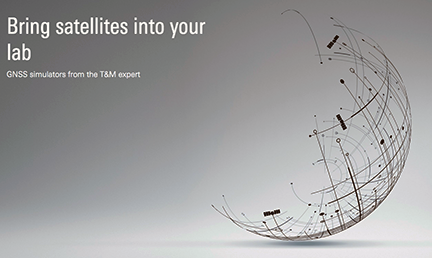 With its recently added simulation capabilities for GPS L5 and Galileo E5, the R&S SMW200A makes it easy to generate complex and highly realistic test scenarios with up to 144 channels in the GNSS frequency bands L1, L2 and L5. In addition to GPS (L1/L2/L5), GLONASS (L1/L2), Galileo (E1/E5) and BeiDou (L1/L2), the R&S SMW200A also supports signal generation for QZSS and SBAS on L1. The available channels can be routed to up to four RF outputs, so that even multi-antenna systems can be tested. Apart from its new GNSS simulation capabilities, the R&S SMW200A remains the first and only vector signal generator that can generate complex coexistence and interference scenarios with multiple interferers. GNSS signals, noise and all interference signals are generated directly in the instrument. Additional signal sources for external generation of interference signals are not required, resulting in small, compact and simple test setups. The R&S SMW200A with its new GNSS simulation capabilities will be showcased at the ION GNSS+ 2018 trade show in Miami, Florida.